Halloween is easily a teen’s favorite holiday—a time to dress up in costumes, eat candy and treat yourself to $3 Chipotle. At BHSEC, Scrap was hosting a little Halloween party in collaboration with other clubs, where many students chose to spend portion of their Halloween. At approximately 3:45, I received a text from my brother, a freshman at Stuyvesant High School. He said there was a shooting “or something” and his school was having a shelter-in. It was ‘something’ alright. I grew more anxious as time ticked on, immediately texting one of my childhood friends who attend Stuyvesant for information (because my brother was clueless). Immediately, my festive mood was spoiled. After calling my father, who had already been informed, I scrounge the web for any pressing details. 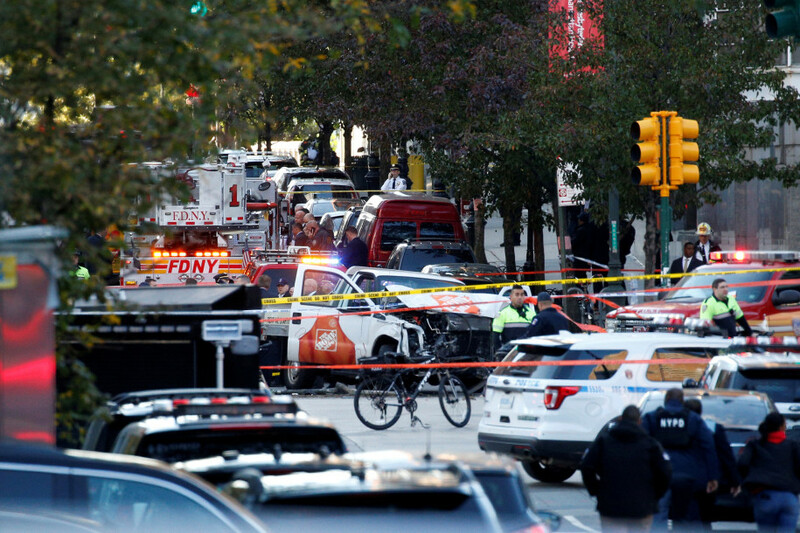 Sayfullo Saipov had rented a truck, and raced down the Hudson River bike path. Within four minutes, he had crashed into a school bus on Chambers Street. He had already plowed through several victims, six dead at scene, and two more later pronounced dead, and this is not including the handful of people that were injured. He had been waving around a fake gun, something that had caused safety concerns earlier. My friend, a junior, was volunteering at the Stuyvesant’s library print station, on the 31st, and a little after 10th period, which starts at 2:54, she heard a crash outside. She hadn’t thought much of it, as she assumed it was the ventilation. Soon after, there was screaming and sirens outside, and moments later the school announced a shelter-in. The librarian had instructed the students to stay away from the window, but not before my friend had witnessed the SWAT team and NYPD crowd around outside, armed. The PA system announces it was simply an accident, probably to prevent the students from panicking, but they had already gotten suspicious, and had scrounged the web, just as I had when I heard the news. There wasn’t much of a legible story at this point, but enough for the students to know it wasn’t a regular accident. Soon enough videos had begun to circulate around the web, and the students easily recognized the background of these videos as just outside of their school. By the end of 10th period, most students knew that the ‘accident’ outside their school wasn’t an accident at all. However, when asked about the school environment, the students reportedly didn’t care about the chaos ensuing outside, “The biggest cause of tension, for the most part, was that everyone was stressed about work. Everyone was stuck inside and they weren’t in the mood to do work while at school.” After school Halloween events were cancelled and not rescheduled. Students are usually allowed to go out for lunch, but the next day only, they weren’t allowed out. Many were bummed about their Halloween plans being cut short, and shared the candy they had brought to school to compensate. However, the student body, overall, didn’t feel they were in any immediate danger. Soon the administration began to dismiss students, floor by floor, released through the school’s main entrance, swiping their ID cards as they exit. The students always had to swipe in, arriving at school, in the morning, but they don’t usually swipe out leaving school. That night, they were informed that any deadlines or examinations tomorrow were cancelled. Being stuck in school for three hours past the end of the regular school day was an inconvenience, but the students did not feel as if they had been in danger. Many attended to their Halloween plans afterwards. People had died in this unfortunate night. Entire families were devastated by this ‘accident’ you simply cannot predict. Ever since 9/11, it is not easy to describe the feeling that it could be you or anyone you know losing their life in an instant, a moment with your guard down, a moment no one ever sees coming. Despite it all, New Yorkers didn’t let their fear consume them. All over New York, Halloween celebrations continued. The Greenwich Village Halloween Parade and Seventh Avenue Halloween Parade went on unfazed. The worry of my friends’ and my brother’s safety was overwhelming at first, not to mention the dread as more deaths were confirmed, but quickly they were extinguished by the fact no one should live their life in fear. We must always be alert and watch out for members of our community, but in no way, should we let this fear navigate our lives. Pointedly, my brother went out that night and trick-or-treated in the cold. Friends continued on to parties they said they would attend. Although the entire ordeal was upsetting, New Yorkers refusing to forget this day or that tragic day on September 11th, sixteen years ago, continued about their business, not letting fear hinder them.